The road leading out from Alushta towards Sudak were really hard to cycle cause it was going up and downhill all the time. The landscapes it was leading through were and are still amazing and I am very sorry, that I couldn't share any more pictures with you - cause after diving my camera broke ;-( Even I used it in the specs... => So time to buy a new one. But back to the roads: I was able to meet a lot of people from Ukraine, Belarus and Russia on these roads who were cycling as well. One day I was cycling with 3 students - and it was obvious it had to came up to a competition - going downhills one of these guys didn't get the turn and had a not to nicely looking crash. After having a closer look at his bike I knew why: My bike is also not the best, I am just riding Alvio - but what kind of brakes they had on their Mountain bikes was really shocking ;-) They were almost not working at all. I fixed the brakes as god it was possible and afterwards the patient was bandaged we could continue. One night I slept at a very small place, which did not even have a name. That night I was invited by Sergej his wife and his sister with husband having dinner. 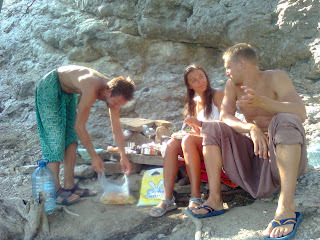 It was great: we had shashlik, were sitting at the beach, talking, drinking vodka... Sergej was a very smart person, we was doctor like his wife and working for the WHO in Moscow. We were talking about so many things and I was and I am still impressed by the Russian hospitality and the way how Russian parents are taking care about their children and great children - and I personally think, that's the point why couples in Russia have earlier and more children, than couples e.g. in Germany - cause the grand parents are taking much more care about their children and grand children than in western countries - if you read Tolstoi's war and peace, you will understand. Two days ago I reached Sudak and yes it is really by far the best I visited so far on the trip. 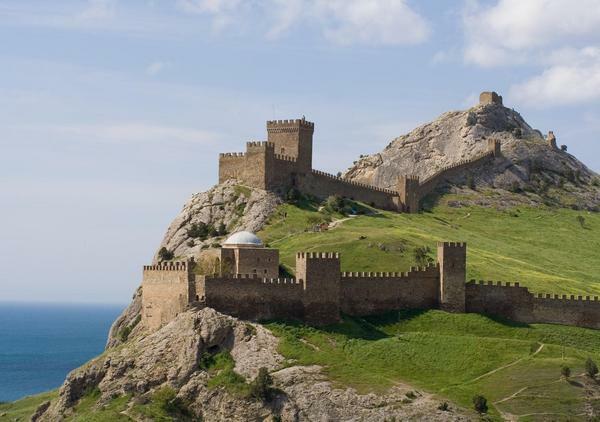 The city is located between great rock and mountain formations, on the top of one of these mountains you can find an ancient fortress - it is an amazing place. It looks a bit than the Great Wall in China, but is located more beautiful and less crowded, from my point it is far better than all forts I visited in Europe, maybe only Masada fortress in Israel had a similar impression to me. 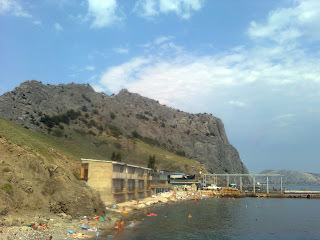 The following picture is from evpatori.ru, where you can find additional information about the place. The nightlife seems to be extraordinary to me - even I did not check it out. 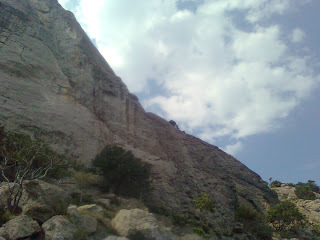 Sudak has very nice cliffs to climb, I met two guy from Moscow, Slava and Aleksandr, with whom I had great hours yesterday and with whom I will climb this afternoon as well. The rock is excellent limestone and bolted very well. 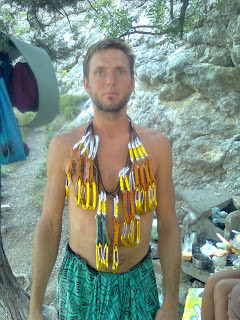 The grades are between 4 for beginners up to 7b, incl. multi pitch routes, more information could be found here: link. 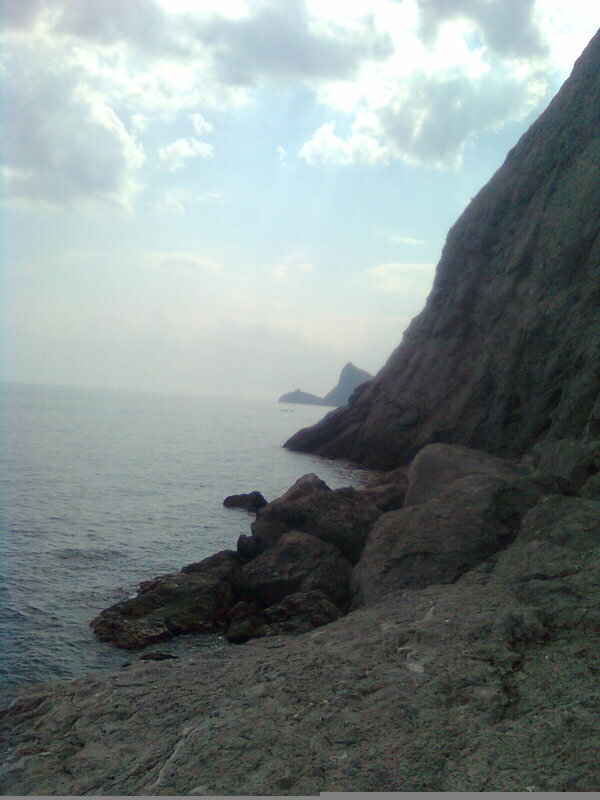 The sea close to the place where you can climb is really wonderful. Not crowded at all, very clean and perfect to snorkel and dive. The place I am staying is great, it is called Hotel Forum link. They have changed their price policy - and therefore you get better rooms you could expect for 35 € a night incl. breakfast, great service and great rooms. I only could stay here until tomorrow, before I have to continue my trip - even I would stay longer... But as the Visa for Russia might end - I have to go - otherwise I might skip Sotchi. Aleks, Slava and his girlfriend. The song I want to share with you, is called "remember me lover" from Porcupine Tree.